The objective behind the introduction of ‘smart’ energy meters is first and foremostly to gain insight into small-scale users’ gas and electricity consumption. The lobbyists for the introduction of the ‘smart’ meter systematically make it seem as if it is all about increasing consumer insight. However, the importance of such detailed insight into energy consumption isn’t so much that consumers can gain detailed information using this electronic equipment into what their household appliances and the ‘smart’ meter itself consume. The most important thing is the data which enables suppliers to provide energy as cheaply as possible on the basis of the behaviour and behavioural profiles of their customers. ‘Knowing’ customer behaviour, being able to predict the latter and having a tool which allows the monitoring of their behaviour enables the peak loads of energy required to be able to serve these customers to be reduced. There are also enormous financial interests involved in the business operations of companies and research institutes that generate income by developing ‘smart’ products such as smartphones, tablet PCs and E-thermostats. Consumers prove to be very unenthusiastic about the fact that they are expected to continually occupy themselves with finding out how to be able to always engage the free market with regard to their basic needs. People have better things to do with their time than ceaselessly searching for the cheapest health insurance, dentist’s treatments, telephone, TV and internet subscriptions and energy contracts. The interested parties in the business community, the research institutes and the government are wildly enthusiastic about the new economic opportunities. The Ministry of Economic Affairs euphorically refers to the ‘golden triangle’ of business, government and knowledge; institutions which – through intensive cooperation – are to reinforce the growth potential of our economy and to provide solutions to societal challenges. The only remaining obstacle to enabling the further roll out of these new products is finding ways to enthuse consumers. Because the proposed law for the compulsory introduction of ‘smart’ meters failed to be passed companies are currently trying to convince customers to voluntarily agree to the installation of ‘smart’ meters using a strategies involving surprise visits (we’ve come to replace the meter because it has to be replaced), charm (honestly, it will save you money) and trying to convince people (we’ll supply them to you free if we have to). The framing of these strategies is based on hammering the idea into the population that ‘smart’ meters lead to reduced energy consumption and are essential for energy conscious, intelligent citizens who won’t allow the business community to pull the wool over their eyes. They are solely based on free market mechanisms. After all, studies have never shown that people who start using energy consuming equipment that accurately catalogues their energy consumption have gained such insight in their energy wastage that they start living more energy conscious lives. Of course, the energy suppliers aren’t out to reduce turnover either. If energy suppliers could have so much knowledge about the behaviour of their customers that they could capitalise on it by keeping the voltage on the power grid as low as possible, they could save millions as this allows them to limit the wasting of unsold, yet already generated energy. The companies that manage to predict and control their customers’ behaviour in such a way that by using usage profiles the maximum power grid voltage can be commercially exploited as cheaply as possible will become the market leader in providing as much energy as possible at the lowest possible rate. In order to optimise this process it is even handier if not only customer behaviour behind the front door can be recorded as accurately as possible (enabled by ‘smart’ meters) but also (and more lucratively) if device consumption can be remotely controlled. The ‘smart’ meter constitutes the gateway to an ‘internet of devices’. A new world in which not only the user can monitor and operate his/her devices remotely, but a system in which devices can independently communicate with suppliers or amongst themselves. Refrigerators that communicate with supermarkets and washing machines that ‘talk’ to people’s electric vehicles. The government also benefits financially from the business community turning over as much energy as possible at the cheapest possible rate. Both directly as a utility company shareholder and from the taxation of both energy turnover and the sale of electrical and gas-powered devices. Moreover, the government can keep a closer watch on citizens by accurately recording the energy behaviour of as many households as possible. According to the law, the government and its representatives the police, the public prosecutor’s office, security and intelligence services can compel energy companies to hand over all the customer data they possess. This applies to both private energy suppliers and the semi-private network operators. Smart meters equal sly spying. For example, the government can, without the parties involved being aware of this, study who consumes more or less energy than average in a particular type of accommodation, at which times people consume energy, how often and for which purposes. This data can burden citizens with an immediate ‘administrative’ suspicion. Think for example, of people who often feel cold being accused of illegally subletting their homes or singles being accused of cohabiting by housing corporations or people being suspected of housing people without valid residence permits. Consumption data can also be used to conclude that people consume more or less energy than they are expected to at a particular point in time when they are supposed to be home or not as the case may be by comparing usage and their labour contract/study obligations/disability benefit/unemployment benefit/etc. These are but a few of the countless data mining options which exits and more options could be created by enriching the information with data from other databases. The option of not only being able to monitor, but also being able to regulate energy remotely provides opportunities for regulating the behaviour of citizens. Energy suppliers and the government and in entirely disastrous scenarios also criminals will be able to intervene by severely curtailing or stopping the provision of energy to private individuals. Citizens on a limited income for example could be prevented from engaging in non-payment by limiting their consumption of energy so they do not exceed their means. There is also the option of providing preferential treatment to neighbourhoods with more smart car charging stations during peak loads over areas that are less profitable to the energy companies, etc. The use of ‘smart’ energy meters which provide remote access to databases of people’s behaviour constitute a goldmine for criminals as well as opening up opportunities for extortion or identity theft. If you allow a ‘smart’ meter into your home which transmits data on your behaviour across the internet you run the risk of this data ending up in the hands of unauthorised third parties. That this constitutes a realistic risk is borne out by the fact that identity theft is one of the fastest growing forms of crime. In this framework it should also be mentioned that the current development of privacy invading ‘smart’ meter systems provides a vision of a frightening future in which totalitarian regimes can quite easily modify citizens’ behaviour by monitoring and manipulating the supply of energy. Het doel van de inzet van 'slimme' energiemeters is in de eerste plaats om inzicht verwerven in het gebruiksgedrag van kleinverbruikers van gas en elektriciteit. De lobbyisten van invoering van de ‘slimme’meter doen systematisch voorkomen dat het daarbij gaat om het vergroten van het inzicht van de afnemers. Het belang van zo’n minutieus inzicht in het energie verbruik is echter niet zozeer dat gebruikers tot in detail via elektronische apparatuur kunnen volgen wat hun huishoudelijke apparaten, en ‘slimme’meters zelf, aan energie gebruiken. Het grote belang van de gegevens is dat het de leveranciers de mogelijkheid biedt om aan de hand van gedrag en gedragsprofielen van de klanten de toelevering zo goedkoop mogelijk te kunnen leveren. Door het gedrag van de klanten te kennen, hun gedrag te kunnen voorspellen en een instrument te hebben om hun gedrag te kunnen monitoren, kan de topspanning aan energie, benodigd om alle klanten te kunnen bedienen, namelijk worden gereduceerd. Ook zijn er gigantische financiële belangen gemoeid met de bedrijfsvoering van bedrijven die en onderzoeksinstellingen die geld verdienen met de ontwikkeling van ‘slimme’ producten als smartphones, tablet-pc’s, E-thermostaten. Zowel de belanghebbenden uit het bedrijfsleven, onderzoeksinstituten als het kabinet zijn razend enthousiast over de nieuwe economische mogelijkheden. Het enige struikelblok om een verder ‘uitrol’ van deze nieuwe producten mogelijk te maken, bestaat alleen nog uit het vinden van manieren om de consumenten er enthousiast voor te krijgen. Omdat het wetsvoorstel voor een verplichte invoering van ‘slimme’meters sneuvelde, wordt nu via een overrompelingsstrategie( wij komen de meter vervangen want dat moet) via een charmeoffensief ( u spaart geld uit heus) en overredingstactiek ( u krijgt de producten desnoods gratis) geprobeerd om de klanten over te halen vrijwillig akkoord te gaan met het installeren van ‘slimme’ verbruiksmeters. De ‘framing’ van deze strategie berust op het bij de bevolking erin stampen dat ‘slimme’meters energiebesparing op zouden leveren en horen bij een energiebewuste slimme burger, die zich geen oor aan laat naaien door het bedrijfsleven. Deze strategie berust louter op marketingsmechanisme. Onderzoeken hebben namelijk nooit aangetoond dat mensen die gebruik gaan maken van energiekostende apparatuur die hun energieverbruik nauwkeurig in kaart brengt, daardoor zoveel meer inzicht in hun energieverspilling zouden krijgen dat ze er uiteindelijk energie zuiniger door zouden gaan leven. Energieleveranciers beogen uiteraard ook niet om minder omzet te gaan draaien. Als energieleveranciers zodanig veel kennis hebben van het gedrag van hun klanten dat ze daarop kunnen inspelen door de maximale netspanning zo laag mogelijk te houden, om toch aan de contractuele leverplicht te voldoen, levert hen dat besparingen op die in de miljoenen lopen. Men kan zo het onverkocht moeten laten afvoeren van overtollig opgewekte energie beperken. En wie het gedrag van zijn klanten zó weet te voorspellen en te bespelen dat men door het gebruik van gebruiksprofielen de maximale netspanning zo goedkoop mogelijk kan exploiteren, wordt marktleider in het aanbieden van zo veel mogelijk energie voor een zo laag mogelijke prijs. Om dit bedrijfsproces te optimaliseren is het nog handiger dat niet alleen het gedrag van de klanten ‘achter de voordeur’ zó minutieus wordt vast gelegd als dat door de ‘slimme’meters mogelijk wordt, maar is het nog lucratiever als het verbruik van apparaten op afstand rechtstreeks kan worden aangestuurd. De ‘slimme’meter vormt daarbij een aanzet tot de ontwikkeling van ‘het ínternet der dingen’. Een nieuwe wereld waarin niet enkel de verbruiker op afstand zijn apparaten kan volgen en bedienen maar een systeem waarin apparaten zelfstandig kunnen gaan communiceren met leveranciers of onderling kunnen communiceren. De koelkast met de supermarkt of de wasmachine met de energieleverancier en de wasmachine met elektrische oplaadauto. Ook de overheid, heeft er rechtstreeks financieel baat bij dat het bedrijfsleven zoveel mogelijk energie kan omzetten voor zo laag mogelijke kosten. Zowel rechtstreeks als aandeelhouder van energiebedrijven als via de belastinginkomsten die zowel over de omzet van energie als over de verkoop van elektrische- en gasapparatuur moeten worden afgedragen aan de Staat. Bovendien kan de overheid de precieze registratie van het energiegedrag van zo veel mogelijk huishoudens gebruiken om de burgers beter in de gaten te kunnen houden. Volgens de wet kan de overheid bedrijven namelijk verplichten om, als verlengstuk van bij politie, justitie en veiligheids- en inlichtingendiensten, alle klantgegevens waarover zij beschikken aan te leveren. In dit geval geldt dat zowel voor de particulier energieleveranciers als voor de semi-particuliere netbedrijven. Slim meten is slinks weten. Zo kan de overheid bijvoorbeeld, zonder dat de betrokkene daar weet van heeft, onderzoeken wie in een bepaald type woonruimte meer of juist minder energie verbruikt dan gemiddeld. Op welke tijden mensen energie gebruiken, met welke regelmaat en waarvoor. Dat vormen gegevens die een directe administratieve verdenking kunnen laden op burgers. Verdenking van het plegen van illegale onderhuur bijvoorbeeld bij kouwelijk aangelegde burgers. Van samenwonen van als alleenstaanden geregistreerde bewoners van een woonruimte. Van het vermoeden onderdak te bieden aan mensen zonder geldige verblijfspapieren. Uit gebruiksgegevens kan bijvoorbeeld ook geconcludeerd worden dat mensen, meer dan op grond van hun arbeidscontact/studieverplichting/ ziekengeld/sociale uitkering,e.d. volgens statistieken te veel of te weinig energie gebruiken op een moment dat zij geacht worden niet, of juist wel, thuis te zijn. En dat zijn maar enkele van de talloze mogelijkheden van datamining die met een veelvoud vergroot worden als deze gegevens worden verrijkt met data uit hele andere bestanden. Door de mogelijkheid om energie niet alleen op afstand te kunnen meten maar ook te kunnen reguleren ontstaan ook mogelijkheden om het gedrag van de burgers te reguleren. Energieleveranciers en overheid, en in totaal rampzalige scenario’s ook criminelen, kunnen ingrijpen in de levering van energie aan particulieren op afstand stopzetten of minimaliseren. Bij burgers met een minimum inkomen wordt het dan mogelijk om het risico op toekomstige wanbetaling te voorkomen door het bij verbruik wat boven hun financiële middelen gaat, de aanlevering bijtijds te verminderen. Er ontstaan mogelijkheden om woonwijken met voldoende smart-car oplaadpunten bij piekbelasting bevoordelen boven wijken waar het energieverbruik minder winstgevend is voor het bedrijfsleven, ect. Het gebruik van ‘slimme’energiemeters, waarbij criminelen op afstand gegevens in handen kunnen krijgen van het gedrag van personen, is een goudmijn voor de mogelijkheden voor afpersing of identiteitsdiefstal. Wie een ‘slimme’ meter in huis accepteert en apparatuur in huis neemt die gedragsgegevens via het internet verzendt, loopt daarmee het risico dat deze gegevens in handen komen van onbevoegde derden. Dat hieraan reële risico’s verbonden blijkt uit het feit dat identiteitsdiefstal een van de snels groeiende criminaliteitsvormen betreft. En in dit kader dient ter volledigheid dan tevens de mogelijkheid genoemd te worden dat de ontwikkeling van de huidige privacyaantastende smart meter systemen zicht geven op het ultieme horror scenario waarbij in een totalitaire staat de overheid het gedrag van alle burgers thuis eenvoudig via de energieleverantie kan volgen en manipuleren. 28-10-2017 Kassa tv Geen toezicht op veiligheid slimme gasmeter https://kassa.bnnvara.nl/media/378633 Tienduizenden slimme gasmeters worden vervangen na twijfels over veiligheid. Emeritus-Hoogleraar Veiligheid en Rampenbestrijding Ben Ale van TU Delft en onafhankelijk technische onderzoeker Peter Coppes van C+B advies zeggen tegen het televisieprogramma Kassa dat er ernstige veiligheidsrisico’s aan de slimme gasmeters zitten. Het gaat om de meters van het merk Landis+Gyr G4/G6 (4.2 generatie). Daarvan zijn er 40.000 in Nederland geplaatst met een defect. Netbeheerders maken geen haast met de vervanging van tienduizenden gasmeters van het merk Landis+Gyr G4/G6 terwijl volgens deskundigen sprake is van ernstige veiligheidsrisico’s. Het CDA, GroenLinks en de SP dringen er bij minister Wiebes op aan om snel uitspraak te doen over de noodzaak om de gasmeters onmiddellijk te vervangen. 20-07-2017 Stedin in de fout - Klacht over de wijze van aanbieden en weigeroptie van ‘slimme’meters in de stad Utrecht. Netbeheerder Stedin vraagt geen toestemming vooraf voor het plaatsen van een ‘slimme meter’ maar verplicht de klant (opt-out) om via de website aan te geven als men de meter weigert. Dat netbeheerders klanten overstelpen met hun reclame voor de ‘slimme’ meters en de optie tot het weigeren liefst zoveel mogelijk verstoppen in hun voorlichting is niet nieuw. Dat men behoorlijk zou handelen door in plaats van een opt-out systeem te hanteren fatsoenlijk toestemming te vragen, is een fatsoenlijke beleid wat geen enkele netbeheerder aanhoudt. Inmiddels is het wel doorgedrongen dat men wettelijk over de scheef gaat als men de klant de ‘slimme’ meter opdringt zonder aan te geven dat het geen verplichting is om het ‘aanbod’ te accepteren. MAAR de praktijk is weerbarstig zo blijkt maar weer eens in Utrecht, waar de ‘aanbiedingsbrieven’ de suggestie wekken dat men de ‘slimme’ meter alleen online kan weigeren terwijl dat ook schriftelijk of telefonisch mogelijk moet zijn. Daar komt bij dat de netbeheerder, die online weigeroptie pas zichtbaar maakt als de websitebezoeker veel reclame en vragen of men niet alsnog te overreden is wegklikt en geen bezwaar maakt tegen het gebruik van ( niet nader toegelicht gebruik van cookies). Als klap op de vuurpijl kan men dan vervolgens alleen de weigering doorgeven als men zijn telefoonnummer en e-mail adres doorgeeft in de verplichte velden. 1- Mijn klacht behelst allereerst het feit dat u een opt-out systeem hanteert, waarbij van mij verwacht wordt dat ik aangeef dat ik uw aanbod niet accepteer. Volgens de wettelijke beginselen van de Wbp zou u vooraf ( expliciet en goed-geïnformeerde) toestemming behoren te vragen. 2- Ik dien tevens een klacht in over het feit dat u van mij eist dat ik mijn telefoonnummer en e-mailadres aan u beschikbaar te stellen om de weigering tot plaatsing te kunnen doorgeven. Volgens de informatie van uw ‘aanbiedingsbrief’ dien ik het weigeren via internet te doen, zonder dat u mij daartoe kan verplichten. A- Ik verzoek u derhalve om de aanbestedingsbrieven zodanig aan te passen dat voortaan ook de mogelijkheid wordt aangegeven om schriftelijk of telefonisch de weigering door te geven. B- Ik verzoek u daarbij om ook bij de algemene voorlichting op uw website aan te geven via welk telefoonnummer of postadres de weigering kan worden vastgelegd. C- Ik verzoek u om in het systeem van ‘online weigeren’ het vermelden van een persoonlijk telefoon- en e-mailadres niet langer als ‘verplichte velden’ aan te merken. Mocht daarop geen bevredigende inhoudelijke reactie komen dan zullen de klachten met verzoek tot optreden van deze toezichthouder worden ingediend bij de Autoriteit Persoonsgegevens. Consumenten die een 'onverklaarbaar hoog' energieverbruik hebben, moeten contact opnemen met hun energieleverancier. Als je een energiemeter wilt laten ijken draait de consument op voor de kosten – als er niets mis blijkt met de energiemeter. Zo'n onderzoek kost tussen de 200 en 700 euro, want iedere netbeheerder hanteert een eigen tarief. De TU Twente waarschuwt dat zo'n meting vaak nutteloos is voor de consument, omdat de test niet uitgevoerd wordt met die zogenaamde 'piekbelasting'. De Consumentenbond pleit voor een onderzoek. "Alle betrokken partijen moet de klachten serieus nemen en de problemen oplossen. Misschien moet sommige meters vervangen worden." De afgelopen jaren zijn in Nederland 850 duizend slimme stroommeters geplaatst die het elektriciteitsverbruik mogelijk niet goed registreren. In uitzonderlijke gevallen kan dit leiden tot meetfouten tot 600 procent, blijkt uit onderzoek door de Universiteit Twente en de Hogeschool van Amsterdam. Netbeheerder Liander, verantwoordelijk voor de meters, erkent dat er sprake is van een probleem, maar zegt niet meer te kunnen achterhalen waar ze zijn geplaatst. De meetfout wordt veroorzaakt door moderne apparaten waarin de wisselstroom van het net wordt omgezet in gelijkstroom. Het gaat om bijvoorbeeld ledlampen, voedingen voor laptops en zonnepanelen. Moderne apparaten met zogenoemde omvormers veroorzaken storingen met een frequentie die vele malen hoger is dan de standaardfrequentie, waardoor er piekjes en kleine dalen in de sinuscurve ontstaan. Deze piekjes worden niet goed door sommige meters geregistreerd, waardoor een overschatting of onderschatting van het verbruik ontstaat. Consumenten met zonnepanelen of een elektrische auto lopen risico op afwijkingen. Liander zegt nog geen idee te hebben hoe het probleem opgelost kan worden en raadt consumenten met een afwijkend verbruik zich eerst te melden bij de energieleverancier. De woordvoerder erkent dat de beheerder verantwoordelijk is voor het leveren van betrouwbare meters, maar zegt weinig te kunnen doen omdat niet bekend is waar ze staan. 'We weten nog niet hoe het op te lossen.' Het gaat volgens de netbeheerder om meters die zijn geplaatst tussen 2012 en 2014. "Waar analoge meters alleen een maandelijkse meting over het energieverbruik afgeven, meten slimme meters het energiegebruik in veel kortere intervallen. Hier wordt er elke 15 minuten informatie verzameld. Niet alleen hoeveel energie er is verbruikt, maar ook wanneer. Een slimme meter geeft daarom een veel gedetailleerder overzicht van iemands privéleven. "Met elke 15 minuten een meting, kan iemand zien wanneer mensen naar bed gaan, in de ochtend opstaan, naar werk of naar school gaan. Iemand kan werkdag- en weekendpatronen zien en ga maar door. Amerikanen verwachten terecht dat hun privé-activiteiten in huis ook privé blijven", zo stelt de brief (pdf). Volgens de privacyorganisaties is het vierde amendement van de Amerikaanse grondwet dan ook op deze gegevens van toepassing. Beide organisaties wijzen daarbij ook naar de situatie in Europa. De EU wil 80 procent van de huishoudens in 2020 over een slimme meter beschikt. De Europese Databeschermingsautoriteit waarschuwde eerder al dat slimme meters het massaal verzamelen van persoonlijke informatie mogelijk maken en adviseerde lidstaten om voldoende beveiligingsmaatregelen te implementeren. Netbeheerder 'Enexis' heeft bij duizenden huishoudens in Tilburg folders rondgebracht met de aankondiging dat 'Slimme meters' geïnstalleerd gaat worden. De folder kondigt de installatie aan waarin wordt verwezen naar een vervolgbrief waarin een afspraak vermeld staat. De slimme meter is niet verplicht en kan geweigerd worden. Er zijn nogal wat nadelen verbonden aan de 'slimme meter'. Er is nog steeds veel discussie over het stralingsgevaar van een slimme meter, die met een bepaalde frequentie signalen doorzendt. Onduidelijk is nog altijd of deze straling schadelijk is voor de gezondheid. De Autoriteit Persoonsgegevens (AP) waarschuwt eveneens voor dit risico en inmiddels zijn er gedragscodes opgesteld voor energieleveranciers, netwerkbeheerders en overige aanbieders van dienst. Dit wil echter nog niet zeggen dat iedereen zich hieraan houdt en dat gedetailleerde, persoonlijke gegevens niet in verkeerde handen kunnen komen. Wie inmiddels al een 'slimme meter' heeft laten plaatsen, kan via de klantenservice van Enexis de instellingen laten wijzigen en ervoor kiezen dat de gegevens niet meer door Enexis worden uitgelezen. De statische energiemeters die de afgelopen jaren zijn geplaatst zijn te goedkoop en te simpel. Frank Leferink, hoogleraar EMC (Electromagnetic Compatibility) verbonden aan de UT zegt dat veel moderne electronica (dimmers, gsm-opladers, led-lampen, etc.) een storende werking hebben op statische en slimme meters. "De ontwerpers van de meters hebben daar niet goed genoeg over nagedacht." Het onderzoek wijst uit dat vooral te hoge meterstanden optreden. Netbeheer NL heeft een contra-expertise uit laten voeren. Een onafhankelijke instelling rapporteerde dat het verhaal klopte. Leferink: "Maar, was toen het verhaal van Netbeheer, het probleem zou zich alleen voordoen bij verouderde meters. Voor de nieuwere meters gelden betere normen. Wat niet klopt. Want ook de verbeterde meters laten dit probleem zien." Vijf van de tien onderzochte meters gaven een te hoge uitlezing aan. De onderzoeker schat daarom dat in Nederland ruim driekwart miljoen meters aan deze kwaal lijdt. De onderzoekers hebben met publicatie gewacht om leveranciers de tijd te geven te reageren. De hoogleraar constateert: “Maar ze proberen alles te dempen. 'Toon maar aan dat het ook in een woning kan gebeuren', zeggen ze. Maar er komen wel steeds meer klachten binnen. Namens Netbeheer Nederland meldt Liane ter Maat 'dat we al een tijdje bekend zijn met de resultaten van dit onderzoek'. Ter Maat: "Die afwijking is er alleen in uitzonderlijke omstandigheden, dus bij een schakelbord met vijftig lampen of grote dimmers, en die komen in normale huishoudens niet voor." Ter Maat bevestigt dat bepaalde meters waarbij het probleem zich voordeed, niet meer worden aangeboden. In de maand februari is de 3 miljoenste slimme meter in Nederland aangesloten. Netbeheerders bieden de komende jaren aan alle huishoudens een slimme meter aan. Het doel is dat 80 procent van de huishoudens eind 2020 een slimme meter heeft. De slimme meters bieden netbeheerders op macroniveau meer inzicht in de pieken op het energienet en maken het mogelijk het net betrouwbaar te houden. Vanaf 1 januari 2019 moeten alle Vlaamse huishoudens de nieuwe digitale energiemeters in huis krijgen, zegt de Vlaamse minister voor Energie Bart Tommelein. "We zijn zeker niet de eersten van de klas, maar de laatsten van Europa. Er is dus geen tijd meer te verliezen. Ik zal er alles aan doen om de vooropgestelde streefdatum van 1 januari 2019 als officiële start van de uitrol van de digitale meters te halen." Tommelein claimt dat netbeheerders al voorbereidingen treffen voor de invoering, al zijn er nog wat kwesties uit te werken. Zo vrezen eigenaren van zonnepanelen dat ze nadeel ondervinden van de digitale meters, die in tegenstelling tot de analoge meters niet teruglopen als huishoudens stroom leveren aan het net. Daar komt volgens de minister een oplossing voor. "Iemand die investeert in zonnepanelen zal duidelijk, zelfs als dat is met een terugdraaiende teller die wordt afgeschaft, in een systeem terechtkomen dat nog altijd rendabel blijft." Daarnaast is het onbekend wie de aanschaf van de meters gaat betalen. De slimme energiemeter heeft een eigen internetverbinding en kan dus zelfstandig meterstanden doorgeven aan de energiemaatschappij. Vanaf januari 2015 wordt de slimme meter door de netbeheerders aangeboden aan alle kleinverbruikers (huishoudens en klein zakelijke verbruikers). Uit de Nationale Energieverkenning (NEV) 2016 blijkt dat het in het Energieakkoord afgesproken doel van 100 PJ extra energiebesparing in 2020 nog niet gehaald wordt. Dit komt onder andere doordat de extra energiebesparing bij kleinverbruikers achterblijft. In de eerste marktbarometer over de grootschalige aanbieding van de slimme meter (Kamerstukken II 2015-2016, 30 196, nr. 468) concludeert RVO dat de gerealiseerde energiebesparing achterblijft bij de verwachtingen, aangezien slechts 6% van de bevraagde kleinverbruikers bij wie een slimme meter is aangeboden aangeeft hiervoor één of meer concrete marktaanbiedingen te hebben ontvangen of in staat is hierover een afgewogen aanschafbesluit te nemen. Als belangrijkste oorzaken noemt RVO onvoldoende communicatie naar de consument over de besparingsmogelijkheden rond het moment van het aanbieden van de slimme meter en bij het tweemaandelijkse verbruiks- en kostenoverzicht en een te eenzijdig aanbod van energieverbruiksmanagers. Hoogstwaarschijnlijk hebt u nu een klassiek elektromechanisch meetsysteem, met een wieltje. Dat ziet u voortdraaien als u elektriciteit verbruikt, en eventueel terugdraaien op momenten dat u zelf meer elektriciteit produceert (bijvoorbeeld met zonnepanelen) dan u verbruikt en u dus uw overschot in het elektriciteitsnet injecteert. Wat heb ik eraan? In een eerste fase vooral een beter inzicht en bewustzijn, 'Het grote voordeel voor de eindverbruiker komt pas in een tweede fase', legt Ruben Baetens van het energieconsultantykantoor 3E uit. 'Er zijn nieuwe toepassingen uit te werken. De elektriciteitsleverancier zou je per uur van de dag andere tarieven kunnen voorstellen: lager wanneer er weinig vraag is. Zo kan een deel van je verbruik goedkoper worden, maar wellicht wordt het op piekmomenten net duurder. Wat heeft de maatschappij eraan? 'Digitale meters zijn een essentiële stap om gebruikers actief te laten deelnemen aan de elektriciteitsmarkt', legt Baetens uit. 'Als je consumenten ertoe kan aanzetten hun verbruik meer te sturen naar luwe momenten, vlak je de vraagpieken af. Moet ik verplicht een slimme meter nemen? Blijft in de toekomst de mogelijkheid bestaan een slimme meter te weigeren? 'Er is nog niets beslist rond de modaliteiten', luidt het desgevraagd op het kabinet van Tommelein. Er wordt benadrukt dat de minister in nauw overleg is met de Privacycommissie. In de sector wordt verwacht dat de digitale meters eerst worden ingevoerd in bepaalde situaties: bij nieuwbouw of een grondige renovatie, bij prosumenten, en bij mensen met een budgetmeter. Plus bij wie er vrijwillig voor kiest. De uitrol van slimme meters in alle Nederlandse huishoudens dreigt op een fiasco uit te lopen. De besparing valt met nog geen 1 procent een stuk lager uit dan de verwachte 3,5 procent. Bij veel reacties straalt het wantrouwen er vanaf. Menigmaal geven respondenten aan geen slimme meter te willen omdat „ze dan kunnen zien wanneer je niet thuis bent” of „omdat de (data)veiligheid niet is gegarandeerd en de meter op afstand gemanipuleerd kan worden indien deze gehackt is”. Alle acht miljoen huishoudens in Nederland moeten voor 2020 een slimme meter aangeboden krijgen. Dagelijks zijn daartoe honderden monteurs op pad. Met de overheid als opdrachtgever, de Autoriteit Consument & Markt (ACM) en Autoriteit Persoonsgegevens (AP) als toezichthouders. En Jan Hofman, programmamanager bij brancheorganisatie Netbeheer Nederland, aan het hoofd van de operatie. 2] Ik heb de slimme meter geweigerd: Ik vind mijn privacy belangrijker dan even een paar minuten per jaar de meterstanden doorgeven. Dat is een ﬂuitje van een cent. Ik zie alleen voordeel voor de leverancier: Zij kunnen een aantal banen van meteropnemers schrappen. 3] Mag ik aub terug naar mijn oude meter? Dan behoud ik mijn saldering, mocht de overheid besluiten dit af te schaffen. Een slimme meter kiezen is dom als je zonnepanelen hebt. Het vervangen van zeven miljoen ouderwetse ’domme’ meters in Nederlandse huizen door intelligente exemplaren dreigt maar een fractie op te leveren van de energiebesparing die van tevoren was beloofd. Daarvoor waarschuwt het Planbureau voor de Leefomgeving (PBL). Door de gekozen aanpak wordt de 3,3 miljard euro die de operatie kost niet terugverdiend als er niet wordt ingegrepen. Nu een kwart van de meters is geïnstalleerd, dreigt de gemiddelde energiebesparing per huishouden die de slimme meter oplevert, te blijven steken op gemiddeld minder dan 1% in plaats van de voorgespiegelde 3,5%. Met het wegvallen van meer dan twee derde van die energiebesparing dreigt het sommetje voor honderden miljoenen euro’s in de rode cijfers te belanden. Overige baten komen uit efficiencywinst voor netbedrijven en betere marktwerking. Het tegenvallende resultaat komt vooral door de keuze voor een schriftelijk verbruiks- en kostenoverzicht dat gebruikers elke twee maanden ontvangen, in plaats van een schermpje bij te leveren waarop het energiegebruik live te volgen is, stelt het PBL in een beleidsnotitie die het maandag publiceert. Dit komt omdat mensen op informatie achteraf veel minder sterk reageren dan op data die direct laat zien wat er gebeurt. „Als energiebesparing het doel is, dan is directe feedback veel effectiever. Het werkt beter als mensen meteen een piek zien als bijvoorbeeld de waterkoker aangaat”, zegt PBL-onderzoeker Kees Vringer. Dat blijkt onder andere uit ervaringen in het Verenigd Koninkrijk, waar bij de uitrol van slimme meters wel schermpjes werden geleverd. Dat leverde daar een energiebesparing van 3% op. Volgens onderzoek dat Eneco heeft laten uitvoeren naar het gebruik van de slimme thermostaat Toon, blijken klanten daardoor gemiddeld 3% te besparen op elektra en zelfs 6% op gas, zegt een woordvoerder. Een belangrijk doel van de slimme meter is om huishoudens te helpen energie te besparen. Overzichten van verbruikskosten en energieverbruiksmanagers kunnen daar bij helpen. Uit onderzoek van Vereniging Eigen Huis naar de tevredenheid van ruim 4.400 consumenten met een slimme energiemeter blijkt dat de helft van hen door de verbruikskostenoverzichten niet gestimuleerd wordt om zelf energie te besparen. Maar liefst een derde van de ondervraagden zegt de verplichte tweemaandelijkse verbruikskostenoverzichten niet eens te ontvangen. Vereniging Eigen Huis vindt het belangrijk dat de slimme meter de consument daadwerkelijk helpt om energie te besparen. Daarmee kunnen huishoudens bijdragen aan de doelen van het Energieakkoord. De vereniging drong in 2014 aan op begrijpelijke, vergelijkbare en controleerbare energieoverzichten, waaronder ook verbruikskostenoverzichten. In 2015 voerde minister Kamp het ‘Besluit factuur, verbruiks- en indicatief kostenoverzicht’ in. Vereniging Eigen Huis vindt dit een goede stap maar constateert dat leveranciers nog niet voldoen aan de regelgeving. De kwaliteit van de verbruikskostenoverzichten moet aanzienlijk verbeteren om de consument te helpen energie te besparen. De Autoriteit Persoonsgegevens is van plan om de gedragscode voor het verwerken van persoonlijke meetgegevens afkomstig uit slimme meters geldig te verklaren, zo heeft de privacytoezichthouder aangekondigd. De gedragscode is door de Vereniging Meetbedrijven Nederland (VMNED) en de Vereniging Dienstenaanbieders Energiedata Kleinverbruik (VEDEK) opgesteld. ...Voordat ze dit mogen doen moet de Autoriteit Persoonsgegevens verklaren dat de gedragscode aan de Wet bescherming persoonsgegevens (Wbp) voldoet Dit houdt in dat de ODA's ondubbelzinnige toestemming van de betrokkenen moeten hebben voordat hun gegevens voor marketing gerelateerde doeleinden mogen worden verwerkt. Ook moeten particulieren de mogelijkheid hebben om hun toestemming weer in te trekken. Verder mogen de persoonsgegevens alleen door medewerkers van de ODA's worden verwerkt die gezien hun taak daartoe toegang dienen te krijgen. Het ontwerpbesluit van de gedragscode (pdf) is onlangs in de Staatscourant gepubliceerd (pdf), waarbij de Autoriteit Persoonsgegevens heeft aangegeven dat het die wil goedkeuren. Belanghebbenden kunnen echter nog drie weken op het ontwerpbesluit van de gedragscode bij de toezichthouder reageren. 26-5-2016 Slimme meters: het Trojaans paard in de huiskamer ? ...Een slimme thermostaat is een thermostaat die het energieverbruik afstemt op het leefgedrag van de bewoners. Zo’n thermostaat volgt het leefpatroon met als doel energie en dus kosten te besparen. Lichtsensor: Deze sensor detecteert wanneer het licht is uitgegaan en zorgt ervoor dat de verwarming uitschakelt. Aanwezigheidsdetectie: De aanwezigheidsdetectie controleert of je thuis bent en zet de verwarming aan of uit. Op afstand bestuurbaar: via een smartphone bijvoorbeeld. Bijna elke energiebedrijf levert een slimme thermostaat. Een ronkende privacyverklaring moet zorgen dat de klant zich geen zorgen hoeft te maken dat dit energiebedrijf iets doet met de data afkomstig uit de thermostaat. Dit geloof ik ook tot op bepaalde hoogte, de wetten rondom privacy waar deze partijen zich aan moeten houden zijn streng. Het risico zit aan de achterkant van de slimme thermostaat, namelijk de fabrikant. Toon, Anna, Nest, Tado, ICY, achter deze lieve namen blijkt een groot netwerk van onbekende bedrijven te zitten dat toegang heeft tot een gigantische berg waardevolle data. De Toon van energiebedrijf Eneco wordt gemaakt door het bedrijf Quby uit Amsterdam. Eind vorig jaar nam Eneco Quby volledig over. Al snel kwam ik in contact met een van de eigenaren van Quby. Hij gaf aan dat data uit de slimme thermostaat alleen lokaal wordt opgeslagen op de slimme thermostaat zelf en wordt uitgelezen door het energiebedrijf. De bijbehorende app slaat de data ook (encrypted) op. ...Ik heb niets tegen slimme thermostaten. Sterker nog, ik wil ook echt geloven dat energieleveranciers niets met mijn data doen, ik wil ook geloven dat de fabrikanten van die thermostaten (de zogenaamde ODA’s) zuinig zijn op deze data. Mijn zorg zit in het onzichtbare gedeelte van de data. Als klant met een slimme thermostaat weet je niet waar jouw data op worden geslagen, wie er wat mee doet en of er andere partijen aan kunnen of mogen komen. Dit gedeelte blijft onderbelicht, en hoe onschuldig data uit een slimme thermostaat ook lijken, het is dat niet. Persoonlijke data is geld waard, veel bedrijven kunnen hier ook weer veel geld aan verdienen, zonder dat je hier als gebruiker iets van terug ziet. Het blijft moeilijk inschatten hoe we onze privacy moeten verdedigen tegen boven genoemde zaken. Zo lang we onze schouders ophalen over onze data, zal de grens elke keer weer wat verder worden opgerekt en zullen bedrijven de mazen in de wet blijven opzoeken. Waar veel geld in omgaat, worden bepaalde zaken niet geschuwd. Een op de tien huishoudens in Nederland weigert de slimme meter, waarmee energiebedrijven de meterstanden op afstand willen uitlezen. Dat blijkt uit door De Stentor opgevraagde gegevens van netbeheerder Enexis. Sommige gebruikers vrezen echter dat criminelen of hackers data kunnen onderscheppen. ...De gezamenlijke netbeheerders hopen dit jaar op 800.000 adressen de meter te plaatsen. In 2020 moet het kastje aan alle Nederlanders zijn aangeboden. De Belgische federale politie vraagt om domotica beter te beveiligen. Via de toestellen in je huis die zijn aangesloten op het internet kunnen inbrekers namelijk makkelijk inbreken. Sign of Time-8 o.L.v. H.v. Elburg van de Rijksdienst voor Ondernemend Nederland, die sinds 2009 in opdracht van het Ministerie van Economische Zaken actief betrokken is bij de introductie van de slimme meter in Nederland. 1-4-2015 Security.nl "Slimme meter": weigeren, of kooi van Faraday maken? Vanaf 1 januari begint de uitrol van slimme energiemeters, een complexe technisch-logistieke operatie zoals bleek tijdens de grootste pilot tot nu toe in de Hoeksche Waard. Nederland kent 8 miljoen electriciteits- & 7 miljoen gasaansluitingen die voor 90 % onder de grote netbeheerders vallen, Liander, Stedin en Enexis. De grootschalige invoer van de zogenaamde 'Slimme meters' in de komende jaren betekent dat de infrastructuur die in de loop van een eeuw is opgebouwd in één keer wordt glad getrokken. Een mega operatie. De Kamerbrief verwijst naar 2 onderzoeken: een zogeheten monitoringrapportage van de Nederlandse Mededingingsautoriteit (NMa) en een onderzoek naar de mogelijkheden om energie te besparen door de slimme meter van Agentschap NL. 05-01-2012 Telegraaf 'slimme meter in paar jaar overal. 25-01-2012 Debat oversmart grids tijdens het driedaagse congres’ Computers, Privacy & Data Protection’ georganiseerd door de Vrije Universiteit in Brussel. Thema: The new-generation electrical grids (smart grids) recently got very high on the agenda of privacy advocates. Despite some noble economic, environmental and security benefits, among others, the issue of privacy and data protection therein still raises a lot of controversies. Why privacy matters for smart grids? Can privacy and smart grids walk together? These issues will be addressed from the perspectives of industry, academia, civil society organisations, policy makers and regulators. Verslag: wetenschappers, vertegenwoordigers van consumentenorganisaties, advocaten, burgerrechtenorganisaties t/m toezichthouders voor gegevensbescherming vanuit alle hoeken van Europa gaven blijk van hun grote zorgen over de immense aantasting van de privacy die door het gebruik van ‘slimme’ energiemeters kan worden veroorzaakt. Alom bleek men van mening dat de ‘slimme’ meters eerst moeten voldoen aan privacy-by-design-privacy-bescherming alvorens de beoogde EU uitrol van de meetsystemen verantwoord zou zijn. Opvallend was dat men in landen als Zweden, waar de burgers oorspronkelijk tevreden waren met het systeem omdat men eindelijk deugdelijke rekeningen kreeg, nu ook begint te beseffen wat er aan gedragsregistratie mogelijk is met dit systeem. Burgers uit landen als Tjechië en Polen blijken feilloos te beseffen wat de gevolgen kunnen zijn van de gedragsregistratie ‘achter de voordeur’. 16-02-2012 Tweakers ‘Tot 2014 krijgen 450.000 huishoudens een slimme energiemeter’. minister Verhagen van Economische Zaken, Landbouw en Innovatie (EL&I) gaf in de Amsterdamse wijk Watergraafsmeer het startsein voor de verdere ‘uitrol’ van de slimme meter. Niet alleen in Vlaanderen groeit de twijfel en weerstand tegen 'slimme meters'. Kosten, baten, security, privacy en zelfs gezondheidszorgen blijken heikele munten. Ondertussen blijken op heel wat plaatsen, ook buiten België de kosten en mogelijke baten in vraag te worden gesteld. De Amerikaanse staat Vermont stelde recent dat consumenten zonder de verplichting tot meerbetaling een slimme meter mogen weigeren. In Canada hebben haast 6 procent van de consumenten in de staat British Columbia gesteld geen slimme meter te willen. Ook in Groot Brittannië zijn er 'counties' waar de bewoners protesteren tegen de invoering van de deze systemen. Concreet wordt in het buitenland ook gewezen op de allicht kortere levensduur van dergelijke meters, zodat sneller dan verwacht vervangingskosten zich aandienen. Zo rekende men in het Canadese British Columbia uit dat de kosten al tot 1,6 miljard Canadese dollars stijgen, met op 20 jaar een besparing ten bedrage van 560 miljoen dollar, terwijl de meters wellicht al na 15 tot 20 jaar moeten worden vervangen. In Nederland krijgen volgens de planning 450.000 huishoudens in de komende twee jaar een slimme meter. De overheid heeft echter de nodige privacymaatregelen genomen; zo is het mogelijk om een slimme meter te weigeren en mogen energiebedrijven alleen de totale stand opvragen. Dat mag bovendien maar één keer per twee maanden. Via de slimme meters is te zien of iemand thuis of op vakantie is, of iemand een bepaald medisch apparaat of babymonitor gebruikt en hoe ze hun vrije tijd besteden. Deze leefpatronen gecombineerd met andere gegevens zijn een droom voor data-miners, marketeers, adverteerders en andere derde partijen, zo waarschuwt de EDPS. De privacywaakhond vindt dat de Europese Commissie meer specifieke maatregelen had moeten noemen om de privacy van Europese consumenten te beschermen. Het gaat dan onder andere om uitvoeren van verplichte databescherming assessments, het waarschuwen in het geval van een persoonlijk data-lek, minimaliseren van de opgeslagen data en de bewaarduur van de gegevensopslag. Voor het gebruik van de 'slimme energiemeters' in Europa moeten er betere regels komen, vindt de Europese privacybewakersdienst EDPS. Door de digitale meters kunnen energiebedrijven digitaal zien hoeveel elektriciteit een klant de hele dag door verbruikt. Ze kunnen de klant ook op afstand afsluiten. Het gevaar is dat anderen de verbinding hacken. De Europese toezichthouder voor gegevensbescherming EDPS adviseerde maandag een meldingsplicht voor hack-gevallen, een betere wettelijke basis en een plicht voor energiebedrijven om de beste beschermingstechnieken te gebruiken. Klanten moeten ook steeds hun verbruik en gegevens kunnen inzien. 04-10-2012 International Day of Action to Stop Smart Meters http://actiondaytostopsmartmeters.org Stop Smart Meters! is a (US)grassroots-funded campaign. Werkgroep Privacy van Groen Links in gesprek met Talitha Koek van de stichting Natuur & Milieu ( de Nederlandse partner van het Renewables Grid Initiative -de drijvende kracht achter het 'smart grid'-concept). Staatscourant ‘Ontwerpbesluit Gedragscode verwerking door elektrciteits- en gasleveranciers en door de onder hun verantwoordelijkheid handelende meetbedrijven van op Kleinverbruikers betrekking hebbende Persoonlijke Meetgegevens afkomstig uit Slimme Meters. 22-02-2011 Eerste Kamer neemt , met 2 jaar vertraging, alsnog de nieuwe gas- en elektriciteitswetten aan. De slimme meter opent ook de weg voor energieleveranciers om nieuwe diensten in combinatie met nieuwe tarieven aan te bieden. Hoe dit er allemaal precies komt uit te zien is koffiedik kijken: een weekendje gratis energie, de wasmachine die alleen draait als elektriciteit goedkoop is. Het kan straks allemaal. Mogelijkheden te over voor creativiteit en inventiviteit. 23-02-2011 - Vrijbit artikel 'SLIMME' METERS DEFINITIEF ENKEL OP VRIJWILLIGE BASIS' Ter afsluiting van deze spannende jaren hebben we ter ere van het aannemen van de wet een vreugdevuur gestookt van de lijsten met namen en e-mail/woon-adressen van de duizenden mensen die de petitie 'wijvertrouwenslimmemetersniet' ondertekenden. Daarmee zijn al deze persoonsgegevens in rook opgegaan, want uit privacyoverwegingen hadden we bij het aanbieden van de petitie aan de Eerste Kamer alleen de lijst met namen en dag van tekenen aangeboden, met het aanbod dat men op verzoek in ons archief de complete lijsten mocht komen inzien ter controle of het aantal ondertekenaars echt klopte. 15-06-2011 - Digitale Burgerrechten organisatie EDRI zet vraagtekens bij de beslissing van de EU commissie dat in 2020 80% van de consumenten een slimme meter zouden moeten hebben. Hoe zit dat in verband met burgerrechten en digitale rechten? 27-06-2011 - Aankondiging dat Google per 16-9-2011eind maakt aan Google PowerMeter, een online dienst voor het bijhouden van stroomgebruik van apparaten in huishoudens. 30-06-2011 - De Europese groep-29 (het Europees adviesorgaan inzake gegevensbescherming0 enaansluitend de belgische commissie voor de bescherming van de persoonlijke levensfeer(CBPL) stellen: "Ook slimme meters moeten privacy naleven"
01-09-2011 - voormalig minister Maria v.d. Hoeven wordt directeur van het Internationale Energie Agentschap (IEA) The Agency has a staff of 260 enthusiastic professionals (energy analysts, modellers, data managers/statisticians, technicians, secretaries and support staff) working together on global energy challenges with the objective of building secure and sustainable energy supplies and markets as platform for promoting economic development, protecting the environment and eliminating energy poverty for the benefit of people world wide. 4-11-2011 Amendement Jansen(SP) om de (nieuwe) leverancier verantwoordelijk te stellen voor het verzamelen van de meetgegevens (meterstanden) in geval van switchen van leverancier en/of verhuizing. 05-12-2011 - Sinterklaasbrief van minister (Verhagen) Brief aan brancheverenigingen over Communicatie over keuzevrijheid voor de consument bij aanbod slimme energiemeter. 6-12-2011 Artikel ICT-faal in wording- Jurgen Sweegers. 'Slimme meter gaat zeker gekraakt worden'.dat denkt de persoon die namens de nederlandse netbeheerders bezig is emet de inkoop van de 'slimme'meter. de vier grootste netbeheerders hebben de handen ineen geslagen voor de inkoop. Er zijn drie gegadigden, waarvan er waarschijnlijk nog één gaat afvallen. problemen liggen op de loer. wat gaat er gebeuren als straks woningbouwcorporaties of bedrijven al A-H massaal gaan vragen om slimmem meters? Die kansd is groot want voor hen is het hartdstikke handig. vanaf 1 januari moeten netbeheerders op verzoek slimme meters gaan plaatsen á 60 euro per stuk. 8-12-2011 audioverslag Interview Joshua hart- Stop Smart Meters! 10-12-2011 lezing Vrijbit over actie tegen verplichte invoering ‘slimme’meters tijdens bijeenkomst ‘burgers op de bres voor privacy’. 02-03-2010 - brief van EK aan Vrijbit dat het 'novelle proces' in gang is gezet. 02-06-2010 - Statewatch Het 'Stockholm Programma "The Shape of Things to come"
29-03-2010 - De slimme energiemeters die in de VS in huizen worden geïnstalleerd, zijn volgens onderzoekers onvoldoende beveiligd. Kwaadwillenden kunnen niet alleen de meterstand manipuleren, maar ook de elektriciteit op afstand uitzetten. 09-11-2010 - TK akkoord met novelle In de veronderstelling dat daarmee de verplichting van de baan zou zijn en kleinverbruikers van energie nu de vrije keus wordt gelaten. Niets is echter minder waar, want nauwkeurige lezing van het wetsvoorstel leert dat mensen óf de installatie kunnen weigeren, óf de meters enkel 'administratief' uit kunnen laten zetten. Daadwerkelijke vrijwilligheid wordt met 'administratief uitzetten' niet bereikt. Immers bezwaarden zouden via die constructie alsnog de facto invoering van de op afstand uitleesbare 'slimme'meters moeten accepteren. 16-09-2010 - de Pers kopt ''Slimme meter niet via celstraf maar 'gedragsbeïnvloeding'. 08-12-2010 - Berichten uit de VS over toenemende weerstand tegen smart-meters in Californië om uiteenlopende redenen variërend van verkeerde rekeningen t/m de effecten van straling op de gezondheid. Hele dorpen komen in actie en prompt wordt er een opt-out wetgeving opgesteld. Intussen gaat het ministerieel offensief voor de uitrol van het project gewoon door. De inmiddels verantwoordelijke minister Verhagen(CDA) wappert met financiële consequenties en poogt goedkeuring van de Senaat te verkrijgen door evaluatie, overleg, onderzoek en oogje in het zeil, in het vooruitzicht te stellen. De uitrol van het project gebeurt nu 'kleinschalig' en het ligt in de bedoeling dat over twee jaar de grootschalige uitrol definitief van start gaat'. En wat nu als uit al die toetsingen blijkt dat de slimme meter op bepaalde punten niet doet wat hij wat Verhagen betreft moet doen, als de kosten-batenverhouding scheef ligt? De slimme meter is "geen doel op zich", maar een instrument dat wordt ingezet om energiezuinigheid te bereiken, stelt de minister. Omdat Kema becijferd heeft dat de vrijwillige invoering van de slimme meter de maatschappij per saldo waarschijnlijk EUR 770 mln oplevert, is Verhagen positief. over de huidige gang van zaken waarbij mensen geen zicht hebben op hoe hun energiegebruik wordt en kan worden gemeten. We hebben hen voorgelegd aan welke bezwaren de novelle niet tegemoet komt. Dat het 'weigeraars', die het niet acceptabel vinden om zo'n meter in huis te hebben, geen rechtsbescherming biedt tegen de aantasting van hun recht op bescherming van hun persoonlijke huiselijk leven. 'Voorts wordt namens de fracties van de PvdA, SP en GroenLinks een brief verzonden aan de regering, waarin onder meer gevraagd wordt om een reactie op de brief van Vereniging Vrijbit van 20 december 2010 inzake de vrijwillige basis voor 'slimme energiemeters'. (41614/WB/JT)'. 21-12-2010 - (Energeia) - De regionale netbeheerders, verenigd in branchevereniging Netbeheer Nederland, gaan samen van start met de inkoop van slimme meters. De netbeheerders trekken daarbij in groepsverband op om allerlei synergievoordelen te behalen. In de periode 2012-2014 verwachten de netbeheerders voor ongeveer 500.000 klanten slimme kWh- en gasmeters in te slaan. Inmiddels blijkt uit meldingen bij Vrijbit dat firma Eneco ongevraagd als 'reclame' de gewraakte meters te sturen aan klanten van andere energiebedrijven met de 'aanbieding' dat ze deze voor slechts € 40 kunnen kopen als ze klant bij hen willen worden. 28-12-2010 - artikel Vrijbit 'verplichting 'slimme meters nog niet van de baan' Over het feit dat de formulering in de novelle dat dan mensen de meters kunnen weigeren of administratief kunnen laten uitzetten, multi interpretabel is wordt nou bedoeld dat of de ene of ander mogelijkheid als vrijwillig wordt aangemerkt of krijgt men beide mogelijkheden. Cruciaal qua rechtsbescherming om vooraf goed in wetgeving vast te leggen en de burger niet op tezadelen met potentiël juridische procedures om hier helderheid over te krijgen. 01-01-2009 - Eerste verzoeken leden van Vrijbit om kwestie 'slimme' meters aan te pakken. 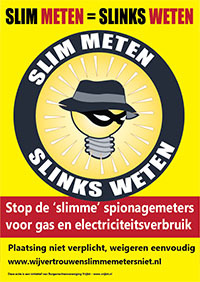 Actie Vrijbit vs 'slimme' spionage meter van start. Op 03-03-2009 zou de Eerste-Kamercommissie van Economische Zaken vergaderen over een nieuwe brief die de minister hen voor 2 maart moet schrijven. 20-03-2009 - Netwerk tv Spionage achter de voordeur. 22-03-2009 - Gooi en Eemlander berichten over bezwaren en dat Oxxio als 100.000 meters heeft geplaatst met 700 tevreden klanten die besparen. 23-03-2009 - webwereld Elektriciteitsnetwerken zijn plat te leggen via de draadloze, 'slimme' stroommeters die nu massaal worden ingevoerd, ook in Nederland. 23-03-2009 - enquête RTV- Noord Holland Big Brother in de meterkast. 24-03-2009 - aanbieden petitie wijvertrouwenslimmemetersniet. 24-03-2009 debat EK :wetsvoorstellen 31.320 en 31.374 die dag van 13.45 uur t/m middernacht in drie bedrijven behandeld worden. Toen de toenmalige minister Van der Hoeven gedwongen werd om uit te leggen wat de wet als sanctie stelde voor de weigeraars, bleek dat weigeren als economisch delict werd beschouwd waarvoor men een boete kon krijgen van 17.000 euro of een celstraf van maximaal zes maanden. Daarmee was het pleit beslecht dat de Eerste Kamer niet akkoord zou gaan. 30-03-2009 - Consumentenbond 'slimme meter weigeren is strafbaar' EK ga niet akkoord. Lancering gedicht 'mevrouw de minister wat maakt u ons nou? 31-03-2009 - Financieel dagblad 'besparing op commando'. 06-04-2009 - 'Consument tegen slimme meter' Ruim 70 procent van de consumenten zit niet te wachten op een 'slimme energiemeter'. Dit blijkt uit onderzoek van het TROS Radar Testpanel onder 26.473 respondenten. 07-04-2009 - Eerste Kamer besluit als noodgreep de voorgestelde wetgeving niet integraal te verwerpen, maar aan te houden totdat het onderdeel van de 'verplichte' plaatsing uit het wetsvoorstel zou zijn geschrapt. Hiervoor is opnieuw toestemming nodig van de TK die in eerdere instantie met alg stemmen akkoord was gegaan. De minister moest toezeggen dat de verplichting definitief van de baan was en dat zij de Tweede Kamer via een 'novelle' zou voorstellen om in te stemmen dat dit onderdeel definitief uit het wetsontwerp zou verdwijnen. Nog diezelfde avond verkondigde zij voor het NOS Journaal dat de meters in de nieuwbouw wel verplicht zouden worden. 08-04-2009 - Rendo Netbeheerder in Meppel tegen verplichte invoering. 11-04-2009 - Klacht Vrijbit bij CBP dat het wetsvoorstel niet voldoende is getoetst en het advies hierover derhalve te kort schiet..
Op 28 april 2009 Sommeerde de EK de minister om gezien haar uitlatingen op tv per brief schriftelijk te bevestigen dat de meter, zonder uitzondering, voor niemand verplicht zou worden. 20-05-2009 - Na aandringen van de EK moet de minister in een brief bevestigen dat de meters echt niet verplicht worden. 'Er is op dit moment dus geenszins sprake van een verplichte uitrol van op afstand uitleesbare meters bij nieuwbouw'. Er worden door de sector nu al wel op afstand uitleesbare meters geplaatst, maar als de afnemer daar bezwaar tegen maakt, stopt de netbeheerder/leverancier met het op afstand uitlezen van de meter of wordt deze meter vervangen door een traditionele meter. 14-08-2009 - EU Richtlijn betreffende gemeenschappelijke regels voor de interne markt voor elektriciteit. De lidstaten zorgen ervoor wanneer de ingebruikname van slimme meters positief wordt beoordeeld wordt uiterlijk in 2020 minstens 80% van de consumenten voorzien van deze slimme meetsystemen. 23-10-2009 - slimme meters natte droom van hackers. 21-12-2009 - Consumentenbond forum: Eneco en Stedin sluiten zomaar oneigenlijk af. 14-06-2008 College Bescherming Persoonsgegevens laat, in een brief aan de minister van Economische Zaken, weten dat het wetsvoorstel over de 'slimme' energiemeter strijdig is met de Wet Bescherming Persoonsgegevens. 'Het verzamelen en beschikbaar stellen van gegevens over het energieverbruik, ongeacht de toestemming van de betrokkene, is niet toegestaan". gewijzigd voorstel van wet. Er wordt een kleine wijziging aangebracht zodat energieleveranciers niet helemaal buiten de klant om zijn gebruiksgegevens aan derden mogen doorverkopen, maar aan alle andere wezenlijke privacy inperking verandert niks. Zijlstra (VVD) om de verplichte uitrol van de slimme meters uit het wetsvoorstel te vervangen door een vrijwillige uitrol kreeg niet voldoende steun. Uitspraak Portugal Future Group ( ministers van Bin ZK) public security, privacy and the technology in Europe: moving forward Concept paper on the European strategy to transform Public security organisations in a connected world. 10-02-2006 - Brief van minister Brinkhorst aan Tweede Kamer met aankondiging dat elk huishouden in Nederland de komende jaren een 'slimme' meter voor het elektriciteits- of gasgebruik krijgt. 'Daarmee kan de meterstand op afstand worden uitgelezen door de energiebedrijven. Met de slimme meters wordt het makkelijker om energie te besparen en kan het illegaal aftappen van stroom onmiddellijk worden opgespoord'. 10-02-2006 - Nu.nl - Brinkhorst: 'slimme' meter in elk huis. 13-02-2006 - Oxxio energieleverancier is super enthousiast omdat het 'de dienstverlening naar de klant zou verbeteren' heeft naar zeggen al 30.000 slimme meters verkocht omdat de markt daarnaar vroeg. 27-04-2006 - Europese Richtlijn 2006 betreffende energie efficiëntie bij eindgebruik en energiediensten dat burgers indien oude meters moeten worden vervangen individuele meters ter beschikking moeten worden gesteld. art 13 tenzij dit technisch onmogelijk is .....Blijkt uit dat het doel energiebesparing is. 31-8-2005 Brancheorganisatie ENERGIEned(tegenwoordig Energie-nederland) start met de voorbereidingen van een massieve, jarenlange promotie campagne voor 'slimme'meters, ingebed in een document 'Een helder marktmodel voor klant en energiesector' genaamd. De markt loopt voorop: sinds december 2005 zouden er volgens energieleverancier Oxxio al ruim 30.000 "slimme" meters zijn verkocht. Nu.nl bericht op 10-2-2006 dat Nuon al tot het plaatsen van 100.000 slimme energiemeters is overgegaan om zo de eigenaren van hennepkwekerijen die illegaal energie aftappen sneller op te sporen. 12-07-2002 Richtlijn 2002/58/EG over privacy en het gebruik van netwerken. Uit hoofde van Richtlijn 95/46/EG van het Europees Parlement en de Raad van 24 oktober 1995 betreffende de bescherming van natuurlijke personen in verband met de verwerking van persoonsgegevens en het vrije verkeer van die gegevens moeten de lidstaten de rechten en vrijheden van natuurlijke personen met betrekking tot de verwerking van persoonsgegevens beschermen en dienen zij in het bijzonder de bescherming van de persoonlijke levenssfeer te waarborgen, teneinde te zorgen voor een vrij verkeer van persoonsgegevens in de Gemeenschap. Deze richtlijn strekt tot eerbiediging van de grondrechten en beginselen die tot uitdrukking zijn gebracht in met name het Handvest van de grondrechten van de Europese Unie. In het bijzonder strekt deze richtlijn tot volledige eerbiediging van de in de artikelen 7 en 8 bedoelde rechten van het Handvest van de grondrechten van de Europese Unie. Slimme meter neemt eindelijk de horde van de Eerste Kamer. Dinsdag 22 februari 2011 heeft de Eerste Kamer, met 2 jaar vertraging eindelijk de nieuwe gas- en elektriciteitswetten aangenomen. De vertraging werd vooral veroorzaakt doordat het verplichte karakter van de zogenaamde ‘slimme’ meters voor energieverbruik in 2009 geen goedkeuring kreeg van de Eerste Kamerleden. Vrijwilligheid ‘slimme’meters voor gas-en elekriticeitsgebruik volgens minister en netbeheerders geen optie. Na 8 weken actievoeren in het voorjaar van 2009 werd door de actie van Vrijbit en druk vanuit de Consumentenbond, op het nippertje voorkomen dat iedereen in Nederland bij wet verplicht zou worden om voor het meten van energie verbruik een digitaal op afstand uitleesbare meter zou moeten laten installeren. De Eerste Kamer weigerde hiermee akkoord te gaan omdat dit een onrechtmatige inbreuk maakt op de privacybescherming en eiste van de minister dat de verplichting uit de wetsvoorstellen verwijderd zou worden.